I have been involved with scuba diving boats for over 20 years. I started diving in 1992 and soon thereafter became a PADI instructor and opened a small dive shop in Fairmont, Minnesota. During this period I ran a Zodiak grand raid and a tri-toon dive boat on local lakes, lake Superior and the Missouri river system. In 2001 the dive shop purchased a well-known 36′ live aboard dive boat offering charters to Isle Royale National Park on Lake Superior. I worked for and earned my Coast Guard Captains license in the winter of 2002 and chartered to Isle Royale for 5 years (summers only). Since purchasing the “Y-KNOT” in 2003, I have been learning the waters of the Gulf including Sanibel-Captiva island areas and the inner coastal waterway from Fort Meyers to West Palm Beach Florida. Over 1100 miles of cruising occurred in the 2005 season in the Bahamas Abaco waters. I settled in the Keys area in 2006 and found the waters in this area to offer fantastic diving and fishing with a more tropical weather pattern than Grand Bahamas. Deep diver, Night diver, Boat diving, Wreck diving, Photo, Equipment, Peak Performance Buoyancy, Dry suit diving, Search and Recovery, Underwater navigator, Ice Diving and Enriched air. I am also an SDI Open Water Instructor and certified with TDI through the level of Advanced Trimix Diver. 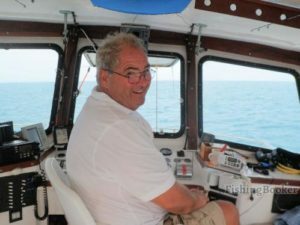 With seven years’ experience in the Key West Dry Tortugas area and the terrific mentoring from Captain Bobby Stomberg, I have a strong working knowledge of the area’s top dive sites, bad weather hide outs and good fishing and lobster bottoms. What I am most proud of is our safety record. No needed trips to decompression chambers for any guests and no fatalities in hundreds of charters with over a thousand guests. Oh yes, we have never left a guest at sea or lost one overboard. Luke is a PADI instructor with a passion for the Sea. Luke hails from England originally, but seems to be enjoying Key West. Presently working toward his Captains license and wants to make a career in the diving business. You will find Luke to be a quick study, a hard worker and willing and able to go the extra distance to make your trip enjoyable. Katie comes to us from Tennessee. She has been a PADI Divemaster since 2009, has over 3 years experience off shore. Has all requirements completed to get her Masters License and wants to make her living in the diving business. Katie isn’t afraid of hard work and can clean a fish as good as the best of em. She has a strong background in marine biology. We welcome Katie to our YKNOT team. Rich has over 26 years experience in key west. 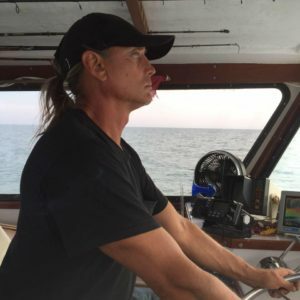 He has spent many years as a commercial diver and has done much of the diving in local marinas for needed underwater repairs. Rich truly enjoys fishing and spearfishing and is ready to help in both areas.